No signal is more perplexing than a car’s check engine light. Is my gas cap loose or is my engine about to die? If your car cries orange a lot, you might be relatively unfazed by the bright light. Oh, is that thing on again? Based on conversations with friends and some time spent looking through online car forums, it seems that Subaru has linked the check engine light to the cruise control on the popular Outback and Forrester (and possibly other models). When the light illuminates, the cruise control is disabled. In order to regain cruise control, the driver has to take the car to a mechanic who can diagnose any potential engine problems. Why has Subaru settled on this design? To encourage preventative care? To boost the profits of its service centers? Both? Addendum: In late-model cars, serious engine problems are usually foreshadowed by a blinking check engine light. Does Hyundai have a bunch of behavioral economists on its staff? Wharton’s journal of management explains how car maker Hyundai pulled off the remarkable feat of selling more cars in 2008 than it did in 2007. When the economic downturn hit, Hyundai came up with a marketing strategy that a behavioral economist would admire. The promotion that has gotten the most attention (and has been copied by other companies in and out of the auto industry) allows you to return a car if you lose your job. This strategy is particularly appropriate for Hyundai, whose customer base is most affected by the recession. But Hyundai also unveiled another marketing strategy that has gotten less attention. In another surprising marketing move, the company last month offered to send buyers of some Hyundai models up to $333 a month for six months. The catch: The deal applies only to cars on which Hyundai is offering rebates. Buyers may opt for either the rebate or the monthly check (not both), and the value of the two offers is about equal. But such programs tend to generate consumer buzz. Amol Agrawal says this offer seems to fly in the face of a classic behavioral economics finding. Behavioral economics has shown that people are impatient. Very impatient. They will take much smaller amounts now (say $10) rather than wait a week for an amazing return on their money ($20). Factoring in interest, Hyundai is offering more money to people who want it all up front. In this uncertain economic environment, Hyundai thinks some patient people will choose the option of a steady cash flow even if it costs a little dough. Why? Well, plenty of lottery winners faced with this very choice opt for the stream of payments. But they are dealing with millions of dollars in winnings. This is much less. Are people tempted to spend the single lump sum payment? People tend to save windfalls of this size, which is why the tax breaks in the recent stimulus bill are being given out in small chunks in order to spur spending. But car rebates don’t come as large checks in the mail two months after you buy a car. They get subtracted from the purchase price at the dealership so they don’t seem like a windfall. It’s too early to know how many car buyers will bite on Hyundai’s offer. If lots do, behavioral economists and marketers might have a new factor to think about in their studies of human decision making. Nissan’s “ECO Pedal” system — promoted as being both green and safe — makes the gas pedal press upward when it senses motorists are speeding up too quickly. Nissan said in a news release Monday the system, which will be available next year, can help drivers improve fuel efficiency 5 to 10 percent. The system calculates the most efficient rate of acceleration in a vehicle based on how fast fuel is being burned and other factors and causes the gas pedal to push back to alert overzealous drivers. A special meter on the dashboard flashes and changes colors to help drive the message home. Nissan plans to offer the pedal beginning in 2009. In true libertarian paternalism form, drivers can opt to turn the system off. 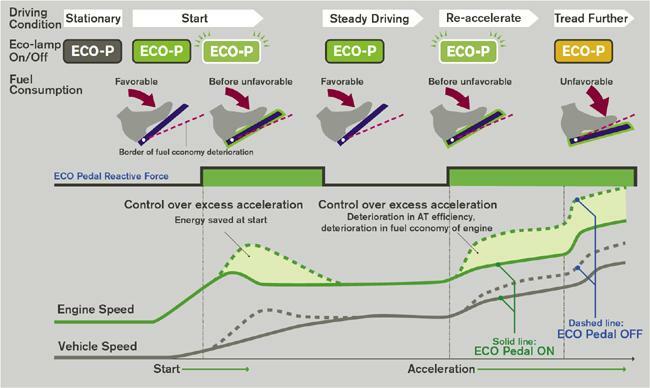 Nissan’s press release has a graphic on how a drivers acceleration is altered by ECO Pedal.